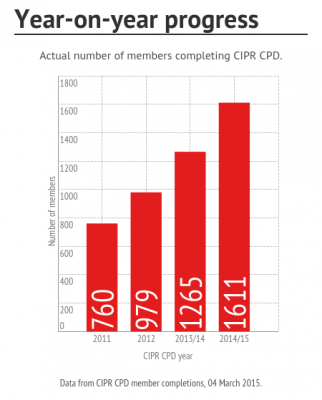 The Chartered Institute of Public Relations (CIPR) has announced an annual 27% increase in CPD completions, with 1,611 CIPR members completing their professional development records, compared to 1,265 completions in 2013/14. CIPR CPD requires participants to accumulate 60 points per year from formal and informal learning to develop their skills and knowledge in public relations and business, and is a requirement in working towards or maintaining Accredited Public Relations Practitioner or Chartered Public Relations Practitioner status. The 2014/15 CIPR CPD deadline was midnight on 28 February 2015. The 2015/16 CPD scheme will open Wednesday, 18 March 2015. From 1 March 2015, reflecting on ethical practice in public relations will be a compulsory module within CIPR CPD. I am delighted that over 1600 CIPR members have demonstrated their commitment to their own professional development through completing CIPR CPD. Ensuring members keep their skills and knowledge up-to-date is key to building confidence in our profession. Looking ahead we have made ethics a compulsory part of CIPR CPD from later this month, and we have developed a new suite of resources to assist practitioners in their reflective learning. It is my belief that 2015 will be the year that professional development will become a pre-requisite for public relations professionals, not a nice to have, and the CIPR will be at the forefront of this change. My challenge to members is simple; get involved in recording your CPD and prove you are serious about professional standards and that you are invested in your professional future.